Avery and I finally made it to the end of our longest stretch with Daddy out of town. Todd spent Monday through Friday in Houston for work, and the girls stayed home. Everything really went smoothly, but I'm thankful to have my partner back. I didn't do much cooking during the week, but I did manage to try out one new recipe. Avery seems to be a budding vegetarian. She only eats meat when she's in the mood which is rare. 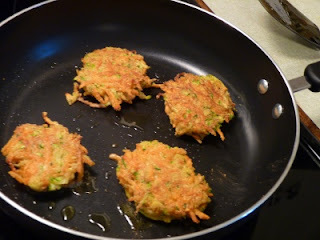 So I tried these veggie fritters the other night, and they did not disappoint. Peel and grate sweet potato. Grate zucchini, leaving skin on. You will have about 1 cup of each. Wrap grated veggies in a clean kitchen towel or paper towels and gently squeeze to extract as much liquid as possible. Transfer to a medium mixing bowl. In a small bowl, combine corn flour and baking powder. Season with salt and pepper. Add flour mixture and egg to vegetables and stir until combined. In a large frying pan over medium heat, heat oil. Scoop out about 2 tablespoons of batter, form into rounded balls with wet hands, and flatten into cakes. In batches, cook cakes, turning once, until brown and crisp, 2-3 minutes total. Using a slotted spoon and letting the oil drip back into the pan, transfer to paper towels to drain, then place on a baking sheet in a low oven to keep warm until all fritters are made. Repeat with remaining vegetable mixture. Like I said earlier Avery handled Todd's absence like a champ; however, his return ended up being pretty rough. Friday night after Todd had come home, Avery slept like a newborn. She was up every 3 hours screaming to get in Mommy and Daddy's bed. It was rough. Then, the next morning Todd went out to a garage sale just down the street. I watched as Avery carried the stool from the bathroom sink to the back door. She proceeded to stand on the stool and look out the window until Todd's return. I think it's sweet; I'm just glad the whole week wasn't like this. 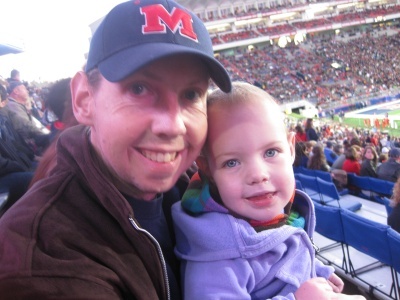 Avery and Todd had some quality time together yesterday when Todd took Avery to her first Ole Miss football game. It was freezing, and I think they only made it through the first quarter. They did have some fun while it lasted though.